Willow Historical Guest House Restaurant stands proud in history and hospitality in the poster town of Willowmore. Brimming with old-world charm and elegant Victorian furniture, this home away from home setting invites languid lunches and intimate dinners in the well-appointed dining room. Steeped in history and character with unsurpassed hospitality and fine food, The Willow Historical Guest House Restaurant pampers the palate with regional fare such as Karoo Lamb, Ostrich, baboti, Tripe, Trotters and Oxtail. The dining room welcomes with scattered antique furniture and local artefacts depicting the historical background of Willowmore heightened by appetising meals and generous full English breakfasts. Enjoy a culinary journey of the Karoo pampered by old-world charm and elegant dining at Willow Historical Guest House Restaurant, off the scenic Garden Route. 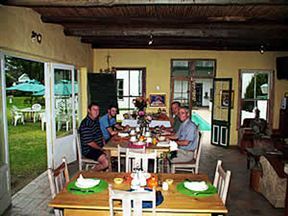 The Willow Historical Guest House Restaurant is 261.1km from the centre of Karoo Heartland , the nearest airport 146.2km (George Airport).